Marmot Exum Guide Gloves. 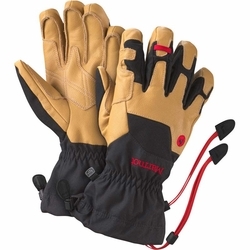 One technically advanced glove for the real-deal mountain dwellers. The Exum Guide Glove--named after those who put it through total use and abuse while alpine climbing and skiing--combines Marmot's most advanced weather-shielding, comfort-inducing materials and insulation to create this techy yet tidy little glove.